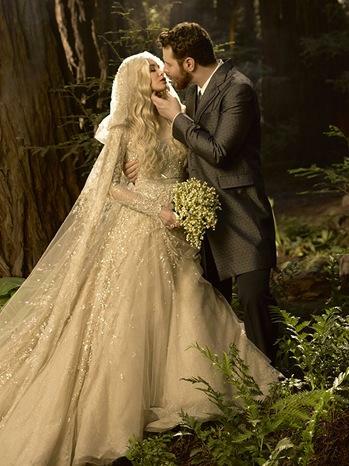 The cult Medieval fantasy series is a massive inspiration for weddings in 2015. The the most important factor is finding the right venue. It would be no good trying to create the right ambience in a Georgian mansion. Sadly we haven't got many dungeons but we have got many magnificent castles to choose from. Pictured below is an interior shot form the absolutely stunning Sudeley Castle in Gloucestershire. We absolutely love this picture of Darren Prew and Kerry Ford, both from Hereford, dressed up as their favourite characters for the event. Darren, a 37-year-old plasterer, was kitted out as Night's Watch warrior Jon Snow while his 33-year-old bride dressed as Daenerys Targaryen. Kerry even arrived on that white horse!! It has a rich and varied history, dating back more than 700 years. The romantic double moated 13th century castle would be perfect for this theme. The Dining Hall, boasting an elaborately carved Minstrels Gallery resting on a series of carved musicians and an impressive stone fireplace surmounted by the Bullen coat of arms, can accommodate up to a maximum of 40 guests for a wedding breakfast, seated on impressive long banqueting tables. To really go for the GoT table settings should be rustic, using good quality items such as candles, large fruit bowls, bunches of grapes, and platters of food boards for sharing. And if you can, use pewter tableware and glasses for your "mead" and ask servers and waiters to dress as "wenches." To see these and the many other options we have listed on the site, just put Castle into the search box, and let your imagination flow…..
on Friday, 16 January 2015.